This is the basic recipe for a traditional tasting summer sausage, which includes a combination of beef and pork. 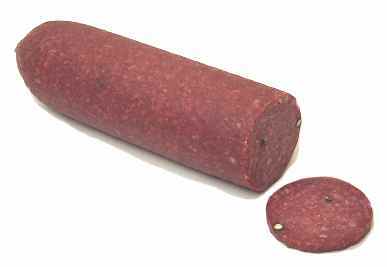 Grind the Meat - The first step in making delicious summer sausage is to grind the meat with a meat grinder. You will want to use a coarse plate in the meat grinder to make the desired texture. Grind each type of meat, then mix the different meats together. Keep the meat cold until you are ready to smoke your venison summer sausage. Cure the Ground Meat - Use curing salts, such as InstaCure No. 1 to cure the meat. Add the salt cure mixture into the meat and mix well. Be sure to keep the meat refrigerated while the meat is curing, which will take several days. You will also want to remix the meat at least once a day during the curing process to ensure a full and proper cure. Season the Meat - According to the recipe you are using, gather the spices and flavorings to mix into the cured meat. You may also use a Beef Summer Sausage Seasoning Mix or a Venison Summer Sausage Seasoning Mix, which have all of the summer sausage ingredients ready to be mixed into your meat. You can mix the meat by hand in a large bowl, but a meat mixer makes the job easy and convenient. Stuff the Sausage into Casings - Now your sausage is ready to be stuffed into casings. What Casings to Use - If you want to use a natural casing, we suggest Beef Bung or Beef Middle natural sausage casings. You can also use synthetic casings or fibrous casings that are 2-1/2 to 3 inches in diameter. What Equipment to Use - You can use a meat grinder the that has sausage stuffing attachments, but you can also use a sausage stuffer, which makes the job very easy and convenient. Smoke the Sausage in a Smoker - Now you are ready to smoke your summer sausage in a meat smoker or smokehouse. Hang the stuffed summer sausage in the smoker or smokehouse and gradually increase the temperature gradually throughout the smoking process. The low temperature in the smoker gently cooks the sausage, preventing the fat from rendering out. We suggest smoking at 140F for 2 hours, then at 160F for another 2 hours, then at 175F until the internal temperature of the sausage reaches 155F. If your smoker temperature can't reach that low, smoke as close to 175F as you can until the sausage temperature hits 155F. After smoking, the sausages are rinsed in cold water to chill them and stop the cooking process. They are then dried and ready to be eaten or stored. We recommend storing the sausage in a vacuum sealed bag using a vacuum sealer. Home Sausage Making Shortcuts - Shortcuts can be taken by home sausage makers to speed up the process and make it easier. The curing time is often cut short, and the sausages are smoked at a high temperature, or even baked in the oven. These shortcuts affect the texture, flavor and keeping quality of the finished summer sausages.